One of the oldest Polish vodka brands, with its roots in 1891, yet produced in the most modern plant in the world. 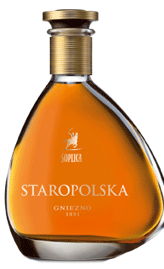 Soplica is produced from high quality spirit from golden grains from western Poland. The well water used for Soplica, is subject to five different types of filtering to ensure extreme purity. Only the best grain from Western Poland is used where soil is rich and fertile and a mild climate allows grain to fully ripen over the summer. A traditional tincture with the taste of juicy Polish cherries. It owes its exceptional taste to a unique composition of natural infusions of cherries taken directly from Polish orchards. A cherry liqueur for connoisseurs of great taste. The genuine quintessence of noble taste of the best kind. An exeptional blend of aromatic infusions of walnut, plum and clove is enriched with a hint of the traditional Polish honey. Produced since 1950 to the same recipe, this is a traditional selected Polish vodka based on the traditional practice of the infusion of herbs steeped in alcohol. Zoladkowa has bitter-sweet taste and unique aroma. It's made from dried fruit tincture combined with selected composition of herbs and spices and is aged before bottling. Among many prizes, Zoladkowa received the prestigious Oskar FMCG 2006 award in branded vodkas category, the CoolBrands award and Gold Medal at Poznan International Fair POLAGRA 2000. A classic, special herb, bitter vodka with added peppermint which is ideal for vodka cocktails. Introduced to the market in 2005. This is a high quality consumption spirit of the gentle and almost neutral flavour and fragrance. Spiritus 96% is used also for preparing home-made macerates, vodkas, liqueurs, and cakes; also for medical purposes. Old Krupnik is back on Australian market! Krupnik is an ancient Polish liqueur which traces its roots back to the 1300's. As such, it has been a traditional drink in Poland for centuries. Krupnik (pronounced kroop-NEEK) is made of natural wild bee's honey gathered in forests and exotic species. It has an outstanding honey-sweet taste and spicy bouquet with a strong, warming effect. The top class vodka whose unequalled formula and smart packaging determine a new quality in the Top Premium segment. Its premium and mature taste was gained by blending the top quality neutral spirit made of grain with the crystal clear water. Krakus Exclusive means the Polish identity, passion and power in each and every drop. Traditional Polish vodka in modern outfit - new packaging! A traditional Polish vodka based on the neutral grain spirit and crystal clear water. Since years, Krakus has been famous for its clear taste whose enhanced formula acquires a unique character. A modern shape of its bottle and an original label emphasise its quality. This quality is well-known and respected in the country and abroad. Faust - the Magic of Fire - new bottle! This high-quality vodka was created by combining the best neutral rye spirit with the crystal clear water. Faust owes its fine taste to the original recipe and a proprietary and unique technology of blending vodka. Magic and mysticism of Faust will always give you unforgettable impressions which will be long remembered. A precious alcoholic drink of delicious dry flavour and unique aroma. This drink is prepared according to an excellent Polish recipe from 1828. The high quality grain spirit and an unequalled composition of macerate of exotic fruits are used in its manufacturing process. Produced from the highest quality spirit and freshly brewed natural coffee. Its perfect taste and aroma is enriched by vanilla and natural caramel. Delicious on its own or as ingredient in cocktails. Perfect with hot chocolate! Produced from the highest quality spirit and infusion of citrus fruit. Can be enjoyed pure served on ice, in coctails or as an ingredient for ice creams and desserts. New packaging and new name coming soon! NEW flavour from ZAMKOWE Family!! The unique taste of real beer with raspberry juice. Malina combines a clean and refreshing aroma with a sweet and delicate taste. Basztowe is a triple-hopped beer with deep, strong taste, for real men who appreciate the power of beer brewed with natural ingredients. An excellent drink and a definitely way of getting sozzled! (...)Basztowe Super Mocne (Super Strong) may look more like a death metal album cover but its assurance of being brewed since 1321, shows that there is plenty of history to the beer. Basztowe is as smooth a beer as you'll find with 9% in. Usually you'll taste notable amounts of added alcohol or the beer will be far too sweet when it comes to Super Strong Polish beers but Basztowe Super Mocne has none of that but still gives you an extremely sozzled kick. Definitely one to check out, don't have too many - the stuff is rocket fuel! Zamkowe is a pale lager with a traditional, slightly bitter taste, brewed using the best quality ingredients. The combination of a traditional recipe, crystal clear spring water, the most refined malt and hops guarantee Zamkowe excellent taste. This beer is the perfect thirst quencher, best when served chilled. Zamkowe is available in bottles and cans. Zamkowe Strong is a beer that drinkers of full-bodied, distinctive tasting beer will definitely love. The highest quality malt and crystal spring water create a clear, strong and refined tasting beer. The quality of Zamkowe is based on the centuries-old brewing tradition of the Namyslow Brewery. Crystal - clear water of the Beskid Mountains springs combinerd with rectified spirit produces vodka of a unique category with its distinctive taste and smell. Crystal - clear purity and transparence are also characteristic of this top quality vodka. White Eagle Lemon, Peach, Pepper and Orange are made from the same high quality vodka as White Eagle Plain. They are all infused with true flavoures of lemon, peach, pepper and orange which makes them a perfect ingredient for a wide range of drinks and cocktails. There are rules...but no limits! Forstic is an effect of creative passion and unbridled imagination, represented in crystal clear vodka composed of water and neutral spirit. Frostic is a product with a catchy and easily memorable name, with the most modern packaging available on the market. This is sentimental journey back to 1950, when the most popular vodka was "Wodka Czysta" (eng. Clear Vodka). Legalna is a rye vodka of very high quality based on an old traditional recipe, but the use of new technology makes it very unique. The smoothing and relaxing qualities of Balsam Zoladkowy (eng. Stomach Balm) are stressed both by specialists and those who seek alcohol with such properties. Its unique taste has been obtained by blending dozens of herbs, spieces and natural fruit flavoures from every corner of the world make it perfect as an aperitif. During the production process, Zubrowka is infused with the bison grass, giving the spirit a natural green-yellow colour and a delicate, subtle aroma flavour reminiscent of almonds. Zubrowka tastes super-smooth, and filles the mouth with the sweet aromas of fresh-cut hay. Each bottle contains one blade of the grass for decorative purpose. Wyborowa is produced according to methods over five centuries old. Its unique taste comes from the use of 100% rye grain in production and no added sugar. Wyborowa is pure, soft and infused with natural flavours. Ideal for mixing, giving cocktails exquisite fruity taste. Old Family Whisky is classic blended whisky, made from various kinds of grain, improved by crystal clear water. A minimum three year maturing process in oak casks, adds to the harmony of taste and aroma. It is sweet with a strong bouquet of apples.